Traditional gluten-free carrot cake frosted with a whipped cream cheese buttercream. Brown sugar spice cake base filled with nutty pecans, shredded carrots, and you can even add raisins or coconut if you like. Moist and delicious! 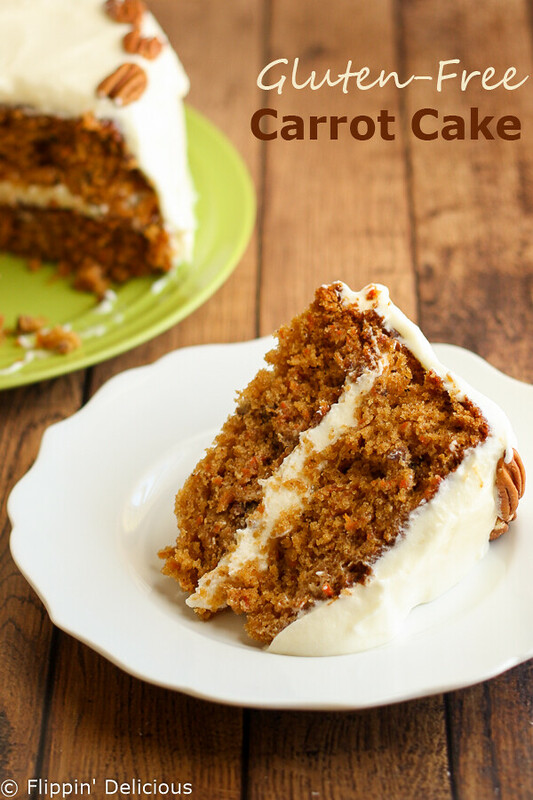 I could not let the week before Easter pass by without sharing a recipe for gluten-free carrot cake. I had wanted to bake a carrot cake last year to share with you for Easter. I even bought all of the ingredients. But I was in my first trimester with Baby T and was just too exhausted and sick to even get off the couch and fix my family dinner, let alone make a gluten-free carrot cake. I am a huge fan of cream cheese frosting, which is probably one of the big reasons that I like carrot cake. Load that baby up with all the cream cheese frosting! The cake is pretty good too, though. Moist, sweet, with the crunch of pecans and that chewy bite that comes from the carrots. If you are a fan of coconut or raisins go ahead and toss some in. The batter should be able to handle 1-1 1/2 cups of add-in (which includes the 1/2 cup of pecans that I added.) so if you really want a nutty cake, add an entire cup of pecans! Want it all? Do 1/2 cup each of pecans, raisins, and coconut. Or do just pecans and raisins. Or leave out the pecans and other add-ins entirely and bask in the pure, unadulterated carrot-y goodness. Layer cakes are really not that tricky to make. Check out my Gluten-Free Red Velvet Cake Recipe to see a photo-tutorial on how to stack and frost a layer cake. There are a few tricks that will make it a cinch. You can also just bake the batter in a 9×13 pan and go the rectangle route. I think it would make an amazing poke cake! Just bake the cake until a toothpick inserted in the center comes out clean. I’d start checking it about 30 minutes. I would recommend baking the cake in 9inch round pans that are 3 inches tall. My pans were 2 inches tall and it didn’t give the batter enough space to rise. The cake ended up being much taller than the pans, and very rounded on the top so I had to trim off quite a bit. If you only have 2 inch tall round pans like mine I’d suggest dividing the batter between 3 round pans and baking 25-30 minutes, or until a toothpick comes out clean. Lightly grease 2 9x3 inch round cake pans. (see post above if you only have 9x2 inch pans). Line the bottom of each pan with a round of parchment paper. In a stand mixer or a large bowl mix together the brown sugar, oil, eggs and milk until the sugar is dissolved. Add the baking powder, baking soda, cinnamon, salt, xanthan gum, and the gluten-free flour. Stir until combined. Add the shredded carrots and ½ cup of the pecans, chopped. Evenly divide the batter between the cake pans. Bake at 350F for 45 minutes or until a toothpick comes out clean. Let cool completely and then frost with cream cheese frosting and garnish with the remaining pecans. I used my rice flour/cookie/cake flour blend. For best results use my blend. If you want to use another blend feel free to experiment. Omit the xanthan gum if you use a different blend that already has it. I need to add that Raia! How could I have forgotten? Because sprinkles are awesome. What a crime! 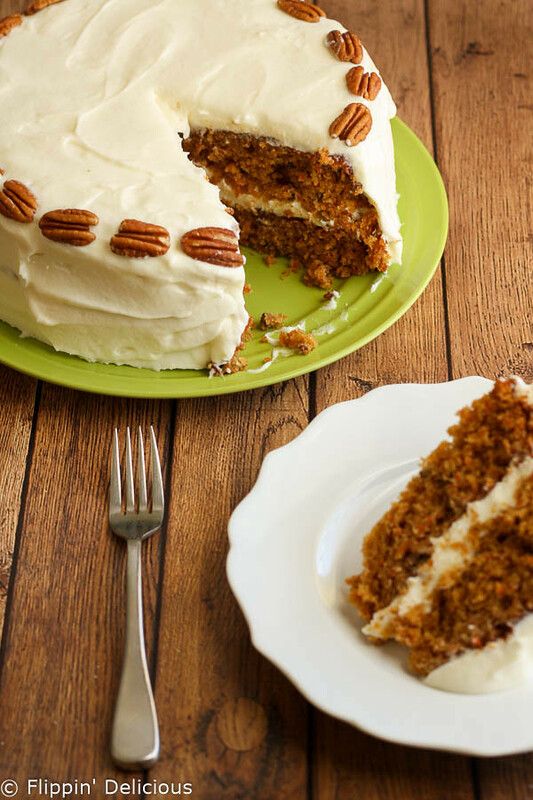 I love a good carrot cake, and this one does not look gluten free! What great results! I love a good carrot cake! Thanks for posting! Google tells me that there are 236.588 millimeters in a cup. Hope that helps! 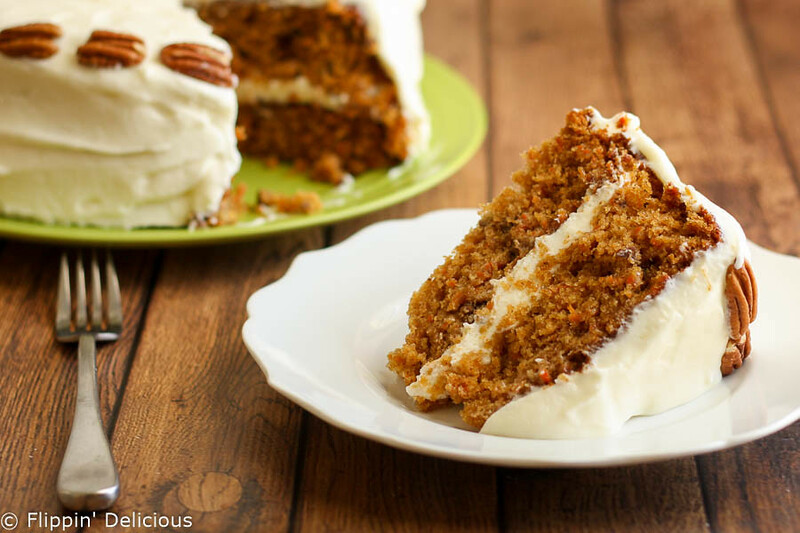 Love carrot cake – one of my favorites. I am starting to try more GF baking recipes but am so confused as to all the different kinds of flours/flour blends. Would I be able to use Bob’s Red Mill Gluten Free 1 to 1 Baking Flour in place of the flour in your recipe? It already contains xanthan gum, so I assume I would omit that? Try it and comment back telling everyone how it worked. All gf flour blends are different. I haven’t used Bob’s Red Mill’s new blend yet, so I don’t know how it would work. And you assumed right, if you are subbing a blend that already has xanthan gum in it omit whatever the recipe called for or you will have a gummy mess. 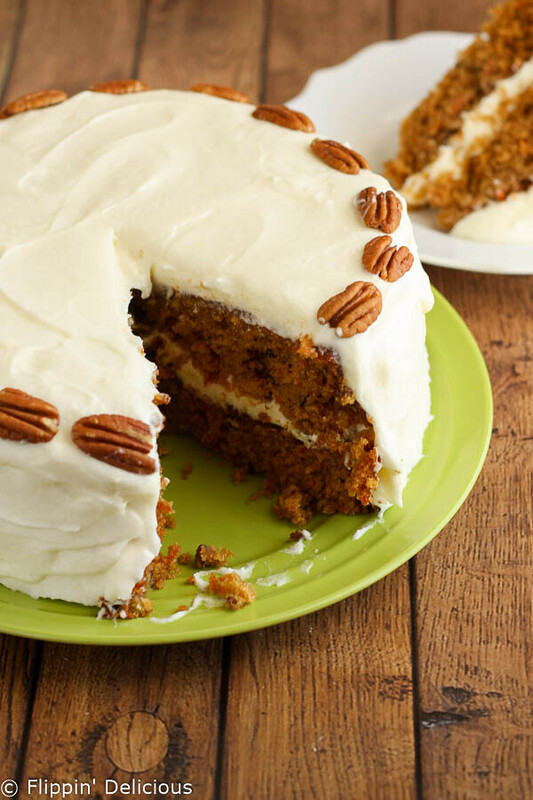 I cannot wait to try this carrot cake recipe! Your photos are making me so hungry and it’s a little too late to whip up a cake. But maybe tomorrow. This weekend for sure. I’ll let you know how much I love it when I try it. Thanks for sharing at Inspiration Thursday! Have a great week! Thanks Lela! I hope you enjoy it as much as we did. It is so hard to type with all of this drool on my keyboard! I love carrot cake. Especially with pecans. Thanks Audrey! I love pecans in my carrot cake too. This looks just too good to be gluten free! Carrot cake is one of my favs! This one looks amazing. Love the gf option! Oh how I would love a slice of this!! !